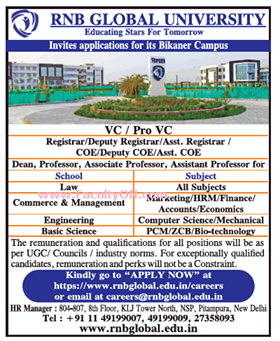 RNB Global University, New Delhi has advertised in the Times of India newspaper for the recruitment of Professor/Associate Professor/Assistant Professor job vacancies. Interested and eligible job aspirants are requested to apply by earliest. Check out further more details below. College Profile: RNB Global University in Bikaner has been established by the Ram Bajaj Foundation, who have made their foray into the educational arena through this zero profit venture. The University has been approved vide Act No. 20 of the Rajasthan Vidhan Sabha. The University has also been approved by the University Grants Commission (UGC) and the maiden academic batch of the University will commence from June 2015.